Officially founded in 1897 by Grand Master Conrado Tortal, Pekiti-Tirsia Kali is an indigenous -method of combat from the Visayan region of the Philippines. Pekiti-Tirsia was reserved in secret as a family system to defend the Tortal land until the art was brought to the U.S. in 1972 by Grandtuhon Leo Tortal Gaje Jr., the grandson of Conrado Tortal and heir to the Pekiti-Tirsia System. Since then, Pekiti-Tirsia Kali has expanded worldwide and influenced the creation of dozens of off-shoot combat systems. Since introducing Pekiti-Tirsia Kali to the Western world, Grandtuhon Leo Gaje has been featured on the covers of leading martial arts magazines and a member of the Martial Arts Hall of Fame and Karate Hall of Fame. Blademaster Grand Tuhon Leo. 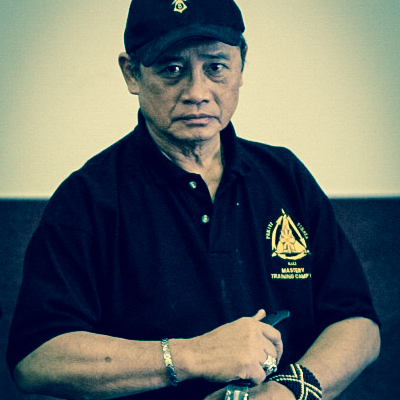 T. Gaje, jr has been recognised by national governments and international martial arts associations for his training and educational programs in the authentic art of Filipino Kali. His legendary teaching skills remain in demand by martial artists, law enforcement and military units worldwide. He is unquestionably the greatest living authority on the use of the Blade. “When it comes to strategic knife defences, Pekiti Tirsia Kali is one of the most progressive, useful, and sophisticated systems I have ever encountered”.